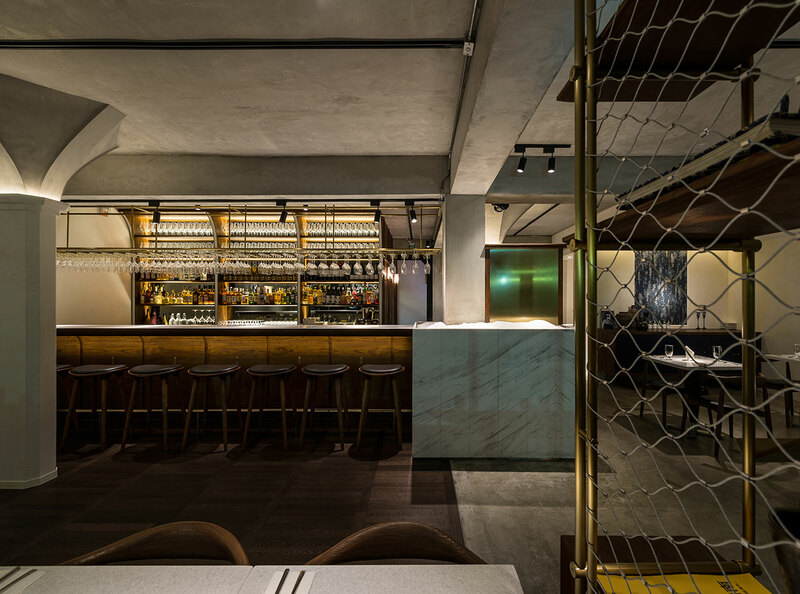 A little bit of European panache has arrived in the heart of Taipei, Taiwan, by way of Oyster Bar by Fujin Tree. 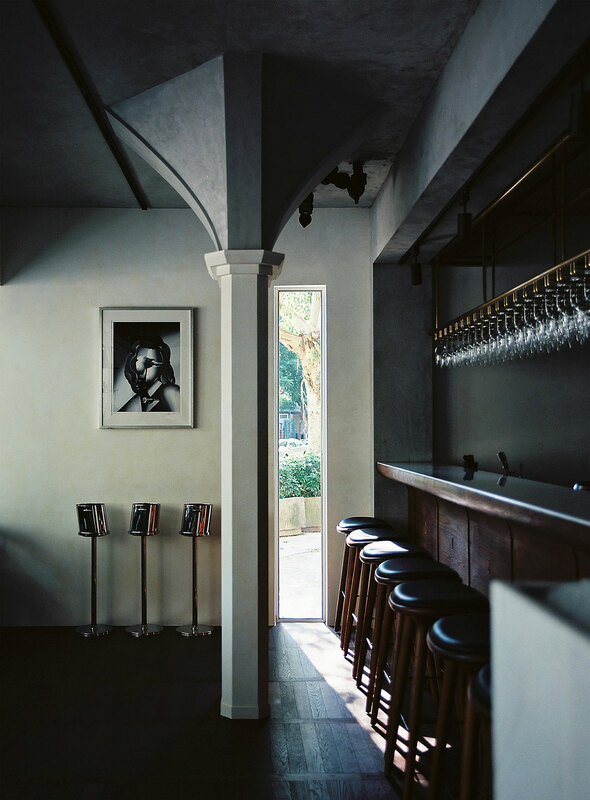 Designed by Shihchieh Jeng and Wenting Hsieh of JSC design studio, this gem of a restaurant and bar is located on a sunny, tree-lined street off the beaten path and recalls memories of Parisian vacations. 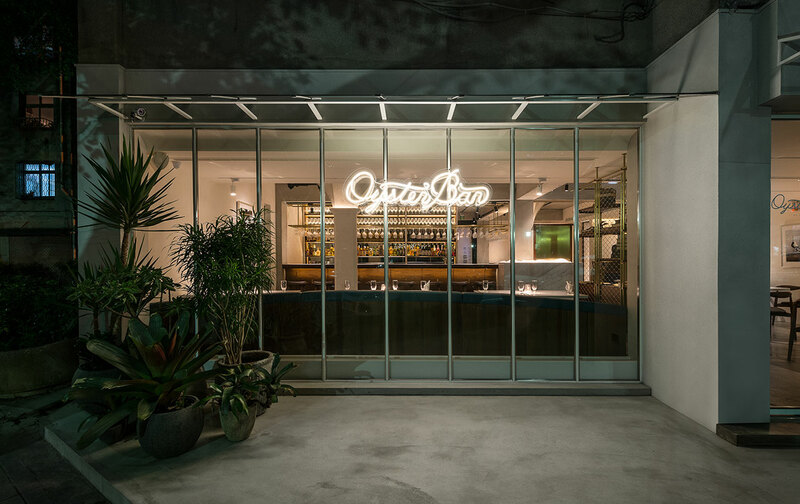 The designers purposefully chose an understated approach, a wise decision that actually makes Oyster Bar stand out from the crowd, patrons can guess that they are in for a relaxing respite as they approach the neon sign in the window which with its simple, white light and elegant script font presents a soothing appeal and whispers rather than shouts its presence. Comprised of white, brown and the light gray of the flying buttress-inspired supporting columns, the space is actually separated by the color scheme into two distinct sections. Comprised of white, brown and the light gray of the flying buttress-inspired supporting columns, with a few graceful highlights such as gleaming brass and transparent glass punctuating throughout, the space is actually separated by the color scheme into two distinct sections. 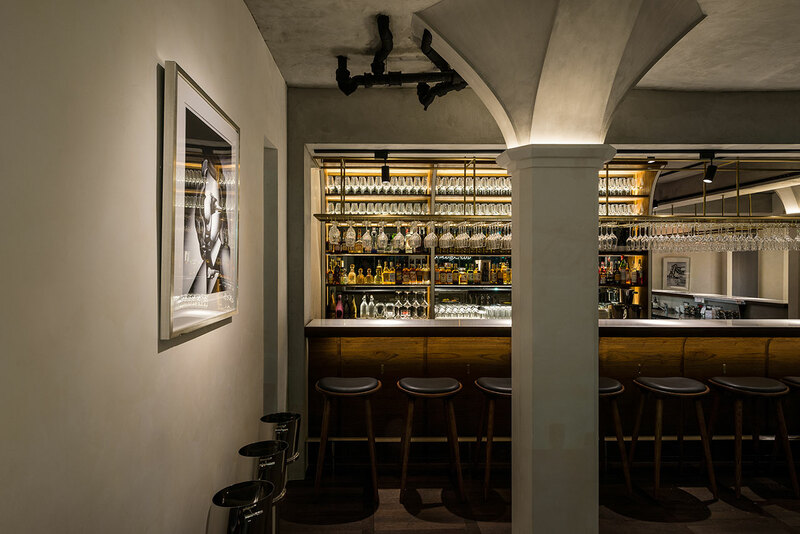 Upon entering, one is greeted by dark wood floors which lead seamlessly to the brown wood bar which curves around the corner, and the overhead brass rack. From there, gleaming, long-stemmed, inverted wine glasses catch the light, at the ready to be filled with the finest Merlot or Chardonnay. 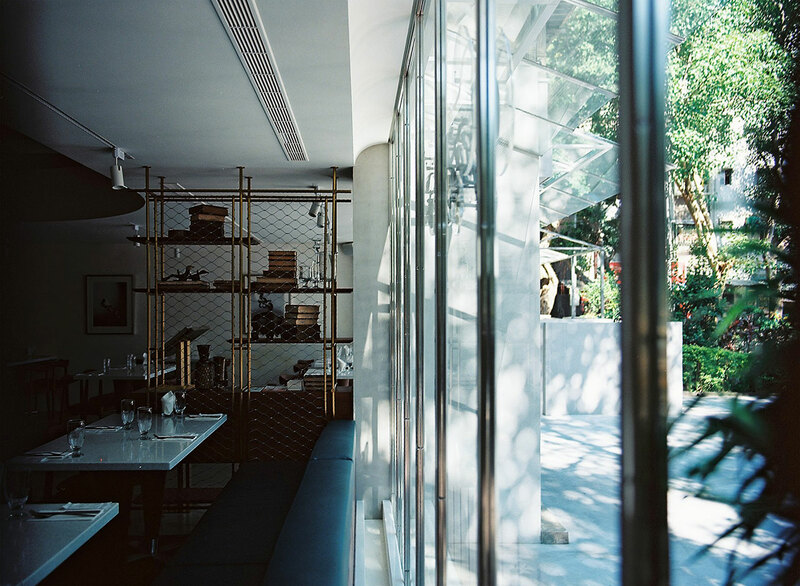 Across from the bar, a long, aquamarine-colored banquet seat provides a subtle color pop and offers patrons a place to recluse for a light meal beneath the warming sunlight streaming in through the wide, French windows. 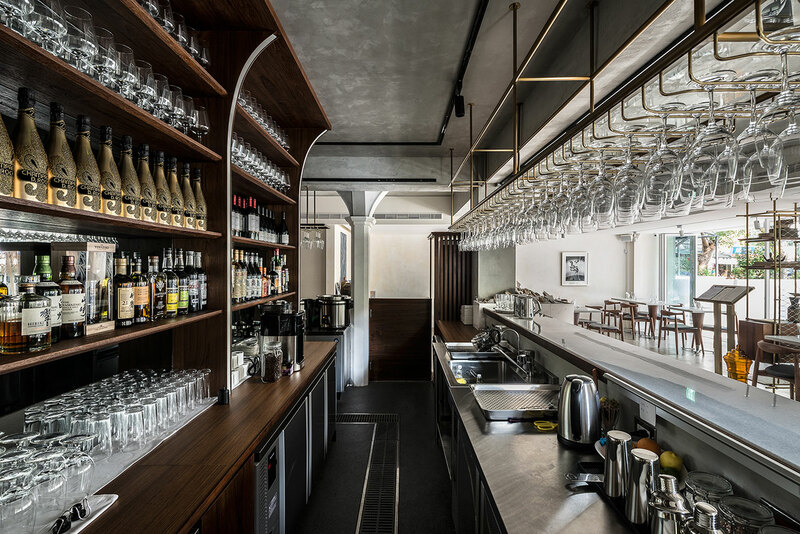 The light brown champagne cabinet and the white marble oyster display at the edge of the bar speak of the establishment's thematic origins and also serve as a delineation point between the bar area and the restaurant space beside it. 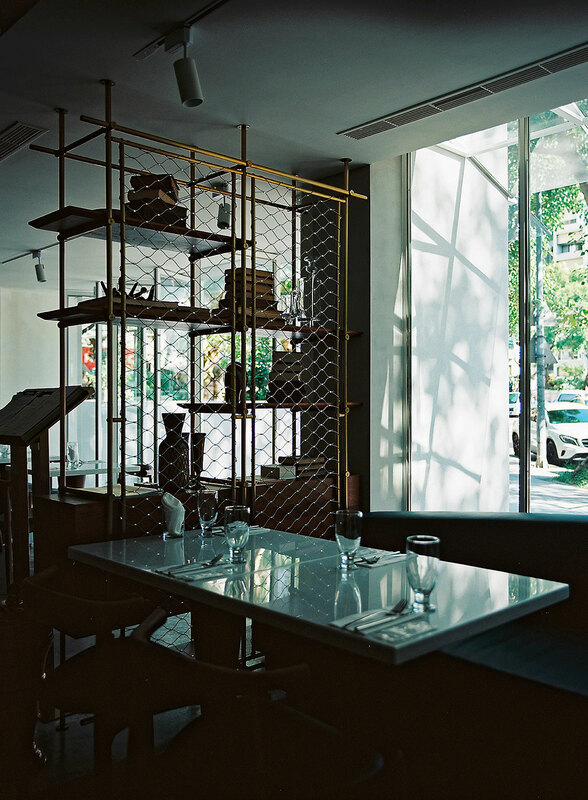 A custom made screen, standing besides the banquet seating, does the same, its simple, elegantly designed, dark wood panels and brass bars encompassing the décor ethos. 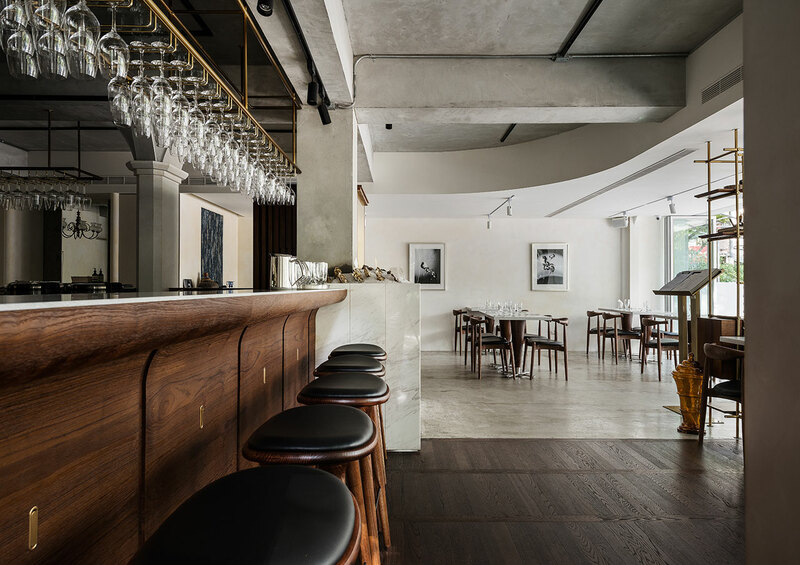 In Oyster Bar's restaurant space a general lightness takes over, – albeit punctuated by the dark wood of the tables' conical bases and the u-back chairs. 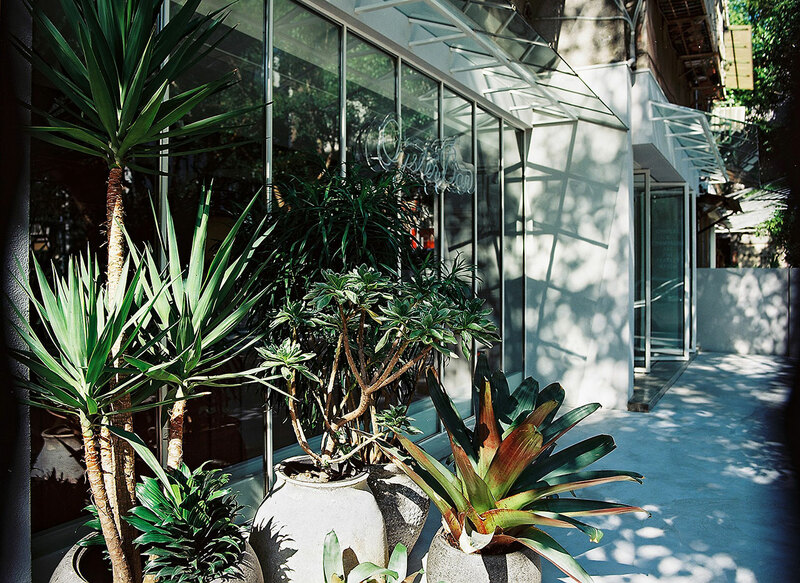 Here too, ample sunlight is once again utilized as a leading décor element and welcomed through the wide open, French windows while translucent glass panels behind the bar allow for the peek-a-boo effect of kitchen preparations as they play out behind the partition. 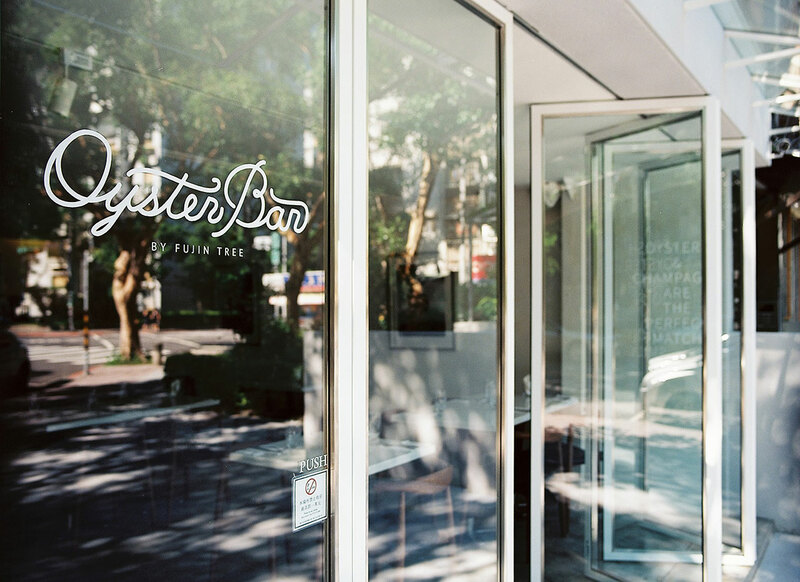 The Oyster Bar has been designed with the sort of subtle décor detailing that requires a second glance in order to be fully appreciated, a decision that has been made with such a robust decisiveness that it serves to amply highlight the elegant beauty of the space, beckoning patrons to come in and enjoy the warmth and delight inside.